Got some beef brisket leftover? 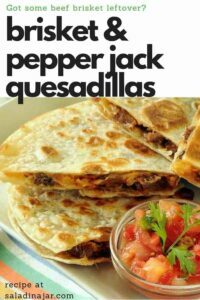 “Remodel” it with these Brisket and Pepper Jack Quesadillas. A little Brie spread inside (optional) and a drizzle of barbecue sauce up the flavor profile. Serve with guacamole or ranch dressing. My father was a Midwest farmer who grew corn and fattened cows. Guess I was pretty spoiled with the really good-tasting beef we had at home, because I don’t eat much beef now. It’s not the same when purchased from the grocery store. Or maybe, it’s a case of things tasting different as an adult than as a child. Twinkies aren’t nearly as good as they used to be, either. So when I do eat beef, it has to be special. These quesadillas qualify. 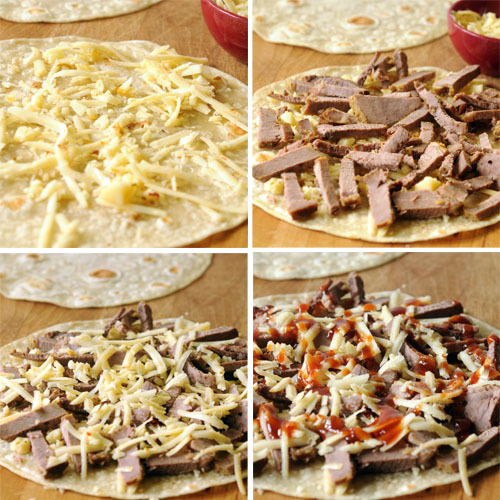 Beef brisket, smoked or otherwise, is sandwiched with cheese and barbecue sauce between crispy, golden-brown tortillas. Make them more sophisticated by spreading a layer of Brie on the bottom tortilla. It adds a subtle and slightly musty flavor I really like. Even without the Brie, the Pepper Jack cheese adds some kick. If you are cooking for somebody who doesn’t do spicy, stick with Monterey Jack. Cheddar will also work. Amounts given below are only a suggestion. I never measure–just pile it on. Be sure there is a layer of cheese next to each tortilla. When melted, it will glue everything together making them easier to flip without losing all the goodies. Even have trouble turning over a quesadilla without losing all the fillings? When flipping a quesadilla, grab another plate. In my case, it would be another paper plate because it’s very lightweight. Place the plate upside down over the quesadilla that needs to be turned over. Using one hand to hold the plate over the quesadilla and the other hand to hold the skillet handle, turn the skillet upside down so the quesadilla falls out on the plate in one piece. Now you should see the browned side on top. Slide quesadilla back into upright skillet and return to your stovetop to finish browning. 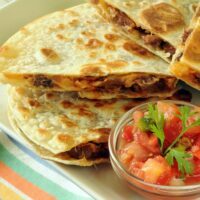 Chopped brisket, brie and pepper jack cheese get a drizzle of barbecue sauce between a couple of flour tortillas to make these tasty quesadillas. 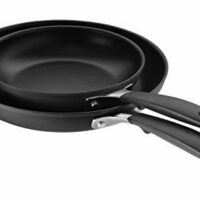 Briefly preheat a medium non-stick skillet. Coat pan with a quick spray of cooking oil. Carefully lay tortilla into skillet over medium heat. Press lightly to help the cheese melt and hold everything together. When bottom is golden brown and crispy, spray top tortilla with vegetable spray and turn quesadilla with a spatula. (See my kitchen secret above for turning quesadillas without losing their innards.) Continue grilling until second side is also brown and crispy. Transfer to cutting board and cut into four or six wedges. I like to use a pizza cutter. Scissors also work well. A knife would be my third choice. Youre absolutely awesome! I have a soirée on Saturday and I did not know hat appetizers to chose! Short, sweet and to the point! Thank you! Your quesadillas look spectacular and I’m all over it! Ps awesome tribute to your dad..I’m a daddy’s girl too! Thanks Penny, Hope your soiree is a success. 92!!!! THAT is an amazing age – he looks wonderful – congrats on an early birthday! 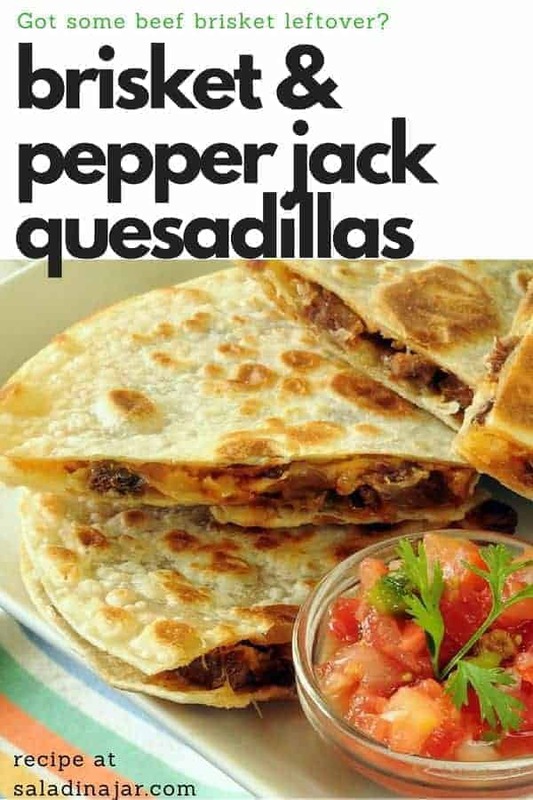 Easy Quesadillas… so easy I just will have to make these! Have tortillas in my freezer and haven’t used them – so I’m all set except for the brisket! That looks easy as well! Your Quesadillas look scrumptious and just might motivate me to make some. You know I’ve never made a quesadilla before. Yes, I eaten tortillas, mostly with Chicken Caesar Salad rolled inside. Being a farmer all his life must have agreed with your Father. He looks wonderful and I hope he has a wonderful 92nd birthday next month. I thank him and all those in his profession who helped put good food on our tables. Looks great. Will have to pass this on to Brent as you have listed his favorite ingredients- cheese, beef, and tortillas. Agree with Scooter- Dad looks great and 92 is amazing!! Looks great! Wish I had some right now. I especially like the tribute and picture to your Dad. Good for him with the scrabble!